The White Inudstries ENO hub is a very clever bit of kit. If you are looking to convert/simplify/butcher an old geared bike into a single speed or fixed gear for duties as a winter hack, commute/pub/hipster bike, or for whatever reason, the chances are that the frame will have vertical rear drop outs. This is going to be a problem unless you find the magic gear for your set up otherwise your chain tension is going to be whack. Normally your derailleur takes care of any differences of chain length or in the case of most single speeds, a horizontal drop out. But, because you would have done without the derailleur and you have no means of moving your wheel back or forward in the vertical dropouts you are now left with a problem. You might think that you can rectify this problem by putting a jockey wheel that will pull the bottom of the chain up either in place of the derailleur or to increase the chain wrap on the front chainset. This is all very well if you are running a freewheel (although in my opinion looks untidy) but if you are running a fixed gear the chain tension reverses from the top of the rear cog to the top of the front chain ring to the bottom of the front chain ring and the top of the rear cog and therefore puts force on the chain device when you do resistance braking. Not good. This clever hub helps you adjust your chain length by having an axle that is off centre (eccentric) by 7.5mm. By putting the offset axle-bolts into your dropouts you can then twist the axle in an arc away from the bottom bracket and correct the chain tension then tighten up the bolts once the slack has been taken up. We'd recommend using this in conjunction with a half link chain so that the smallest amount of correction would be needed or you could find your wheel offset by almost a centimetre. 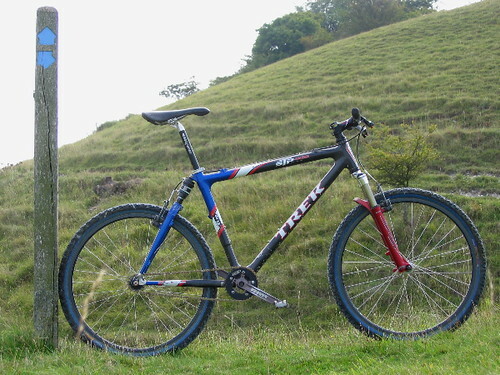 It didn't have a noticeable effect on the geometry of the bike either, as long as you weren't in the extremes. The high polished alloy body (also available in black anodise) is beautifully machined from solid billet using strong 6061-T6 aluminium alloy which helps keep the weight down to 325grams which is about 20 or so grams lighter than say a Miche track hub. Running on 2 super smooth and replaceable cartridge bearings should mean easy maintenance when the time comes which won't be any time soon. Simple servicing instructions are available on the White Industries website. This hub is a flip flop design allowing you to run a screw-on freewheel on one side and a fixed cog mounted on a spline with an English lock ring keeping it in place on the other. See separate upcoming review for cog. Once correctly adjusted with a spanner and a hex key the hub hasn't moved one bit, keeping the chain perfectly tensioned and, because the cog is mounted on a spline, there hasn't been any slip or loosening, giving you consistent, instant, reliable feedback. Also available is a disc/freewheel version primarily for off road single speed riding. A top quality hub that offers an excellent solution to converting any frame with a vertical drop out into running a fixed gear or single speed freewheel. A hub designed to take up the slack of a chain where no other adjustment is offered i.e. horizontal drop outs, eccentric bottom bracket. Ideal for fixie/single speed conversions whether for road or off road, not only is this hub light but it is also strong! Available in 126, 130 or 135mm axle spacing. Machined from solid billet 6061-T6 Alloy. Fixed/free flip flop hub. Uses a splined fixed cog and standard threaded freewheel. It looks beautiful, even the engraved logo. Lightweight and strong = performance. only runs on two cartridge bearings which are replaceable. The only way to make this hub lighter would compromise strength. This looks quality. Buying the cog that mates with this hub is the only real sting. The splined cog fitting means no more slipping. EVER. I've been running an ENO rear on a spare carbon race frame since last summer as a go-fast fixed gear bike and it's a really well designed and robust hub. The quality of the fit and finish of the splined sprocket is superb - expensive but it feel like it will last a very long time. Adjustment isn't anything like as complicated as the instructions infer - position the eccentric behind and below the axle and pressure on the saddle tensions the chain - or carry a 19mm cone wrench rather than a heavy adjustable. sounds like it's better for road use than offroad then VJ? well the new bearings survived a lot longer than the originals (do americans ever understand about perma-damp when it comes to bearings? ), whether they'd last long under a Winter of road grime i couldn't say, but the hub did make this a more fun than a barrel of buttered monkeys for which i am forever thankful.. I have the WI Eno hubs (standard, not the eccentric ones)on my single speed Pace RC200, and also had to swap out the bearings fairly soon, but since fitting some decent SKF races they lasted a good few muddy Chilterns winters. looks like it has a standard thread on one side though, no?